One of the most frequently asked questions on the forums is how do I silence that Anet A8 fan noise? Well this article will explore the options you have. 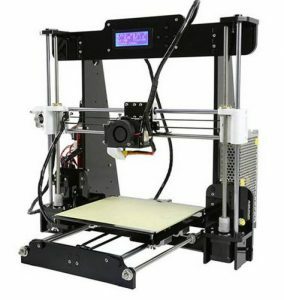 Which Anet A8 fan is installed? You have two fans which can be installed when building. Most people ditch the extruder cooling fan or modify it and only replace it when they have issues with heat on the extruder motor melting the filament causing jams. The other is a radiall fan which is used to cool the filament as it comes out. The radiall fan is capable of moving 18 cfm (cubic feet per minute) at 7000 rpm (revs per minute). Supplied with a voltage of 12v it draws 0.18A so consumes about 2watts of power. The bearing type is a sleeve bearing. So when you are printing you enable this fan to come on to cool your print. It is not on constantly or fully on, this is the one you can control either from the gcode file or the menu screen. It will not start below a certain percentage and ramps up to full speed. After a few weeks of operation this fan may start to get noisier, and maybe even squeal a bit when starting up. To start with lifting the label and placing a drop of oil on the spindle quietens it down, but very soon the noise is back. Essentially you have got three main options. Replace like with like. So keep going with a sleeve bearing. This is a plain bearing with a pin in a sleeve. The lubrication is good at the start but quickly moves away from the area where it Is needed and wear starts, along with vibration and noise. Increased temperature will increase the wear of the bearings. As said above a drop of oil will increase the life of the bearing. The fan starts out noisy and gets noisier throughout its lifetime. These types of bearing will fail with no notice – so if you do go this way then keep a couple of spares in just in case. They are the cheapest of the options. Or look into a ball bearing fan- make sure you get the dual ball bearing as some of these are ball bearing on one side and sleeve bearing on the other. The ball bearings or bb fans are more expensive but longer lasting. They tend to be louder at the start than sleeved bearings, but will quieten down with run time. The performance out of the box over time is good. Again higher temperatures will prematurly wear the bearing due to loss of lubricant. They have a more predictable failure mode by getting noisier before failing. Or you can go with one of the newer hydrodynamic bearings. Although these are essentailly a sleeved bearing they have been modified to allow the lubricant to circulate. They are the most expensive, due mainly to licencing fees. They are very clever in the fact that they use the fans own rotation to create a flow of fluid around the bearings. These are extremely quiet bearings and fans – almost whisper quiet. These bearings are sealed so should not lose lubrication over their lifetime. Even when runnig at elevated temperatures. You do have to watch out for some inferior types which are not so good, but generally all of these types are extremely quiet. Another modified veriation of this type of bearing is the sso bearing, where a magnet keeps the bearing centralised to further increase its lifetime and allow operation in any direction. The sleeve bearing and bb fans are readily available in axial and radiall modes. But the hydrodynamic fans tend to only come in axial fans. The actual volume of air throughput is lower with the hydrodynamic fans, so you may need a larger one to compensate. But to get the silence I would go for a 40mm cooling fan and a 50mm duct fan. So there you have the main types of fans with their bearings. Instead of that jet engine taking off why not treat yourself to a quiet print experience and change to a silent fan. You will be amazed at the difference in noise, I know I was. The only difficulty is mounting it, being an axial fan you need to funnel the output flow down onto the hot extruded filament. But there are mounts for this available to print and fit, so there you have another noise removed. Bearing replacement is covered in the article on changing your bearings to igus bearings. All you have left is the motor noise and this is dealt with by the addition of the trinamic drivers the TMC range. These will be covered in another article. Hopefully now you will be replacing that jet engine of an anet a8 fan to being one where you an hear yourself think.